I like to use the brand's descriptions to be sure I don't miss mentioning a pigment or something specific/important. So those are below, along with some comments from me. Bridezilla - White crelly with a rainbow of shimmers! I found this polish to be a bit challenging to apply, in that it was fairly thick and tended to dry quickly. Because I am not a pro at 'wrapping the tips' I didn't even think to try it so the free edge is not very smooth. I spoke to the box host who contacted the brand. The box host relayed back to me that the polish would be adjusted to be a bit thinner. 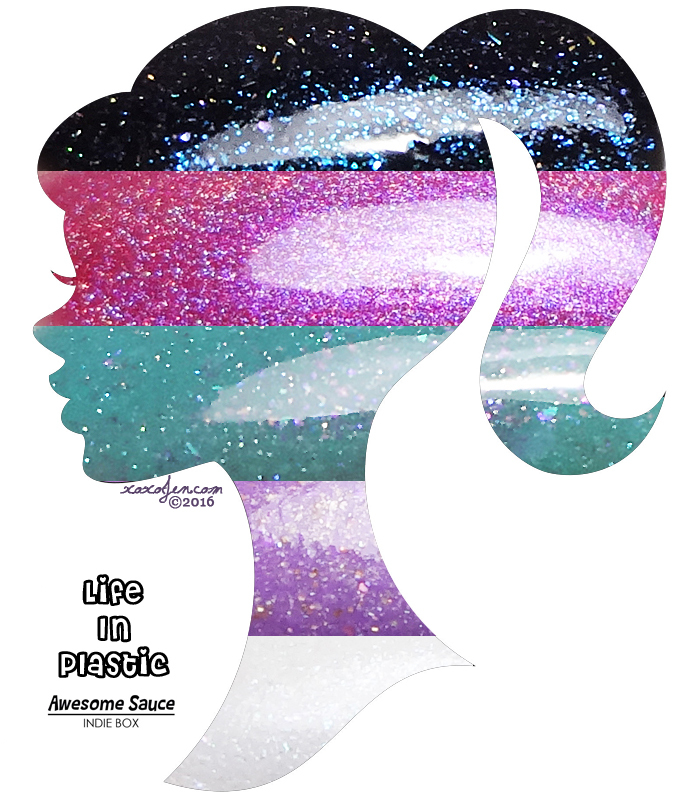 Barbie Girl - A hot pink linear holo with a slight lilac flash. Slight is an understatement! I think the purpley flash was quite vibrant and almost pearlescent looking - what a beautiful finish! Malibu Barbie - Blue aqua crelly with pink specks and holo shimmer. I checked with Rachel and found that this polish is intentionally sheer to allow for light to reach the delicate flecks inside it. I wore four coats, which builds a very nice depth - akin to jadeite glass or looking into a clear ocean where you can see the coral and sand at the bottom. Demolition Barbie - A black polish with color shifting glass based pigment in a blue to purple shift. 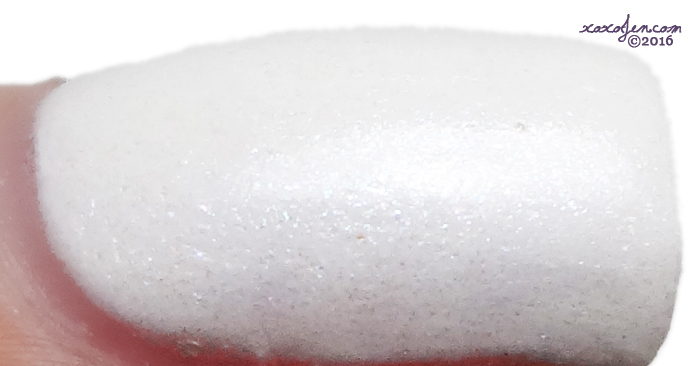 As well, for an extra pop, micro holo flakies. Woah sparkle girl! LOVE how sparkly this black polish is - there's magic in that bottle. Let's Go Party - A lovely lavender crelly with gold shimmer, micro silver and gold holo glitter plus fine holo pink glitter and a splash of scattered holo. 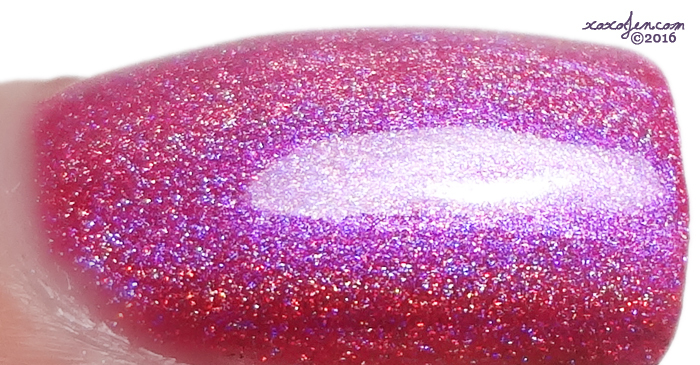 From further away, the glitter blends well and is difficult to see; but when you get close you can see the hidden beauty and unusual glitter colors used. All the polishes were opaque in two coats and had no formula issues unless otherwise noted. Which are your favorite? What's that, can't decide? Me either!! They are all beautifully done and I love the theme and names of the polishes too. I hope you've enjoyed my review and will come over and follow me on facebook. Wowza! I love all the shades in this box! I can't wait for this box!!! I hope you've snagged one! Lovely collection! My favorites are Demolition Barbie and Let's Go Party! I agree, I love all the shades, they go well together too. Isn't it though? and thank you! I am so head over heels for this entire box. Such a fun concept, love me some Barbie! Great box and theme! 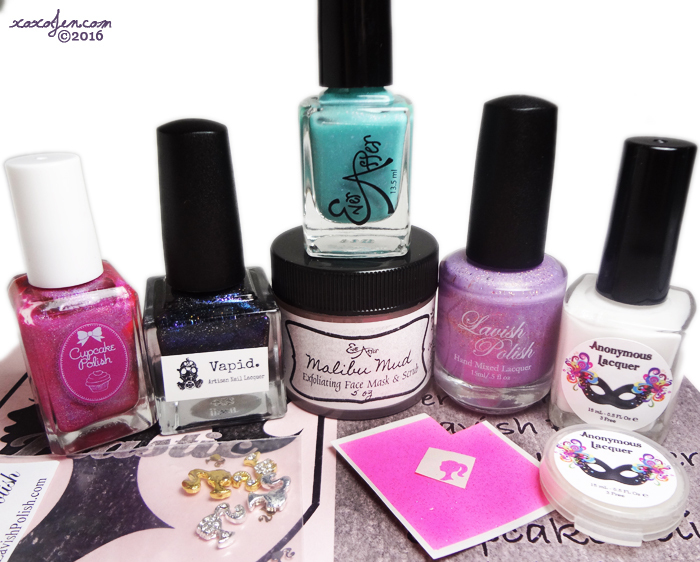 The polishes are all gorgeous! It's hard to pick a favorite! 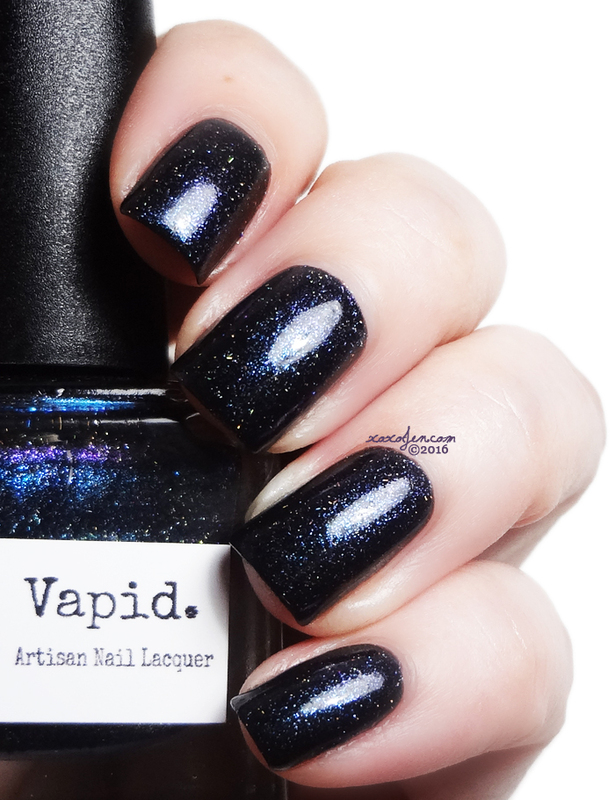 I am jonesing so bad for this box, but especially the Vapid! Thank you for reviewing and sharing!